Idaho wildlife officials are puzzled as to why hundreds of deer have jumped off a bridge to their deaths. Motorists tell officials they have witnessed deer jumping off High Bridge and plunging more than 100 feet to their deaths while they are driving by. “I’ve seen it myself and some of our staff have seen it too,” Evin Oneale, a manager with the Idaho Fish and Game Development, told KBOI-TV. Oneale believes that the deer are just trying to jump away from the oncoming cars. The station reports the Idaho Fish and Game, along with Idaho’s Department of Transportation, built an underpass for the animals back in 2010 in an effort to help curb the deer jumping. 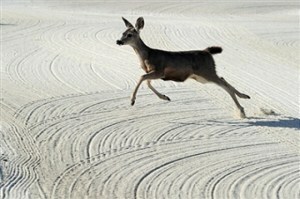 Officials say it has worked but warn motorists to slow down as to not startle the deer into jumping.